Many people are sorely disappointed to find out that they do not qualify for a free government cell phone. Either their income is to high or they do not participate in one of the state or federal assistance programs that would automatically qualify them for one of the phones. Well, now there’s another inexpensive paid plan for those people. It comes from a company called TextNow Wireless. TextNow Wireless plans start at just $18.99 per month, require no contracts, offers a 30-day money-back guarantee, and come with unlimited texting to and from the United States and Canada. In other words, it’s the next best thing to free. But that’s just the beginning. TextNow Wireless also allows you to keep your existing phone number, offers unlimited airtime with other TextNow users, plus unlimited incoming calls. Your phone number will work with your phone, your tablet, and your computer. Oh, one more thing. When we say the TextNow Wireless plan costs $18.99 per month, we mean that’s the total price. Unlike low-cost plans from many carriers, that price includes all taxes. The Moto G is an affordable yet high quality smartphone that brings the world to your fingertips. Browse the web, use apps and play games on the 4.5″ 720p HD LCD screen, or take photos with the 5MP rear-facing camera. This phone fits perfectly in your hand or pocket and has a beautiful design. 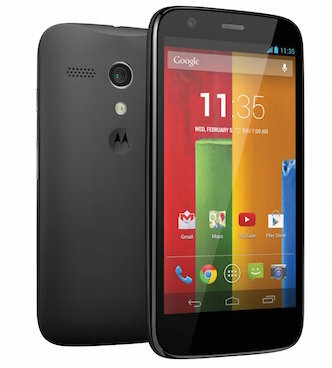 Although that sounds like a terrific price for a Moto G phone, keep in mind that you cannot buy the phone only. All devices require the monthly plan for it to work. A few months ago, when we first discovered TextNow, it was offering the same phone for $49.99, so this is a good time to take advantage of the new, special low price. The Grande Plan that offers 1 gig of data, 1250 roll-over minute, and unlimited texting and incoming calls for $26.99 per month. The Vente Plan offers 2 gigs of data, 2000 roll-over minutes, and unlimited texting and incoming calls for just $39.99 per month. We’re not sure why the company names its plans after drink sizes at Starbucks, but we really don’t care, either. Our only interest is finding inexpensive cell phone plans for needy Americans, and these plans are about as inexpensive as any paid plans available. TextNow routes everything over the internet — all texts and all phone calls. It uses a wifi connection whenever one is available. If your phone can’t find a wifi connection, it automatically switches over to Sprint’s nationwide 3G and 4G network. TextNow promises that you will never be charged overage fees. The company will notify you before you hit your data limit and offer you the option of upgrading to its next highest plan before you top out. If you decide not to upgrade, your data service will be suspended until the next billing cycle begins. But TextNow takes the pain away by allowing you to continue using your device where WiFi is available. Does texting and calling use my data? When you are on WiFi, texting and calling does not use your data. When you’re on 3G and 4G, calling and texting does not use much data at all. You can send thousands of texts with 1mb of data and 1 minute of calling will use approximately 0.3mb of data. Now let’s talk warranties. One of the biggest complaints we hear from free government cell phone customers is that the quality of their refurbished cell phones is problematic. That shouldn’t be an issue with TextNow. All of its phones come with a 1 year warranty. If something goes wrong with your Moto G, TextNow will send you a free replacement cell phone. TextNow’s Tall Plan ain’t free, but it ain’t bad. It doesn’t really offer enough data to allow customers to do much web work, but phone calls are virtually unlimited when you think about with free unlimited calls when you can get a wifi signal, and free incoming calls. In fact, free wifi signals are so readily available in today’s world that we think you’d would be hard pressed to use up TextNow’s 750 free non-wifi minutes. We are not in the business of recommending cell phone plans, but TextNow’s Tall Plan is certainly worth looking at if you do not qualify for a free government cell phone. That’s usually a sign that you entered the wrong PIN number three times. To correct the problem, you need to call your free government cell phone service provider and ask for a PUK. There are two parts to Text now. The free part, which is an app or web site, you can use to send and receive text. That part, you can’t make, or receive phone calls. (Though oddly, someone can leave a voice mail. Go figure.) Oh, and you don’t have a phone. The Pay part, you get an actual phone, to use as any other cell phone, up to the assigned number of minutes according to the plan you sign up for and pay to use. The sending and receiving of texts however, are free, and unlimited. can I pay for minutes on line? Buenas estoy buscando un telefono cellular para mi mama. Ella tiene el medicaid y medicaren. Me gustaria saber si ella cualificaria y si los telefonos que ustedes ofrecen los botones son grandes para personas con deficultad para ver de cerca y otro se pueden hacer llamadas para Puerto Rico. Sounds good to me worth looking into.